The brand new made in Germany Portable Drilling and Milling Machine, MAB 825 KTS from BDS Maschinen GmbH. The MAB 825 KTS is equipped with a magnetic cross table base. The cross table can travel 110 mm in X-axis and 120 mm in Y-axis. The cross table enables the machines to perform light milling operation to create keyway slots or oval holes, offset bores and hole patterns. 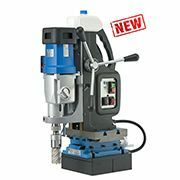 The MAB 825 KTS portable milling machine can perform drilling, tapping, reaming, countersink and milling thanks to its heavy duty reversible motor. This portable keyway slot milling machine is equipped with Morse Taper 3, magnetic indicator, oil bath gearbox, overheat protection, safety clutch, carbon brush wear indicator, full wave control electronics, etc. BDS Maschinen GmbH is a Broach Cutters Manufacturer from Germany. BDS also manufactures magnetic drilling machines and beveling machines.